If you are among the many people who color your hair at home-- then perhaps it's time to consider a superior custom-made product as an alternative to the familiar drugstore brands. 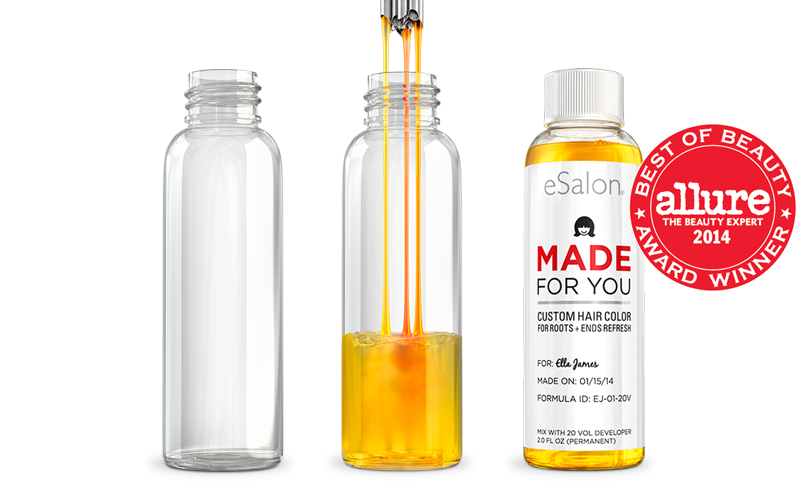 In fact, eSalon products boast such extraordinary quality that it's worth coloring your own hair rather than going to a salon and spending a fortune. I imagine that eSalon is causing a great many salons and colorists sleepless nights because their excellent products provide salon quality results at home, and so affordably. I tend to color my hair at the end of each summer because my naturally dark brown hair becomes much lighter and far more red from all of the sun exposure here in Los Angeles. I almost always color my hair myself, and eSalon hair color is unquestionably superior to anything that I have ever purchased at the drugstore. For a mere $20.00 eSalon will create a highly personalized hair color that is custom blended just for you. * To get started, you simply click here and answer a detailed survey. You are first asked to identify your natural hair color (shown above), then what percentage of gray hair you have, and then they ask you to get very specific about the type of color and chemical treatments that you use. They continue with a whole series of questions to determine your skin tone, eye color and current hair color in order to make your custom blend well suited to your complexion. They leave no details to chance, and even ask questions about how well your hair takes color, and how often you would like to color your hair. They also ask about the length of your hair, and your hair type (i.e. curly, straight or wavy). They then ask you to select your desired hair color, and whether you want a Permanent or Demi-Permanent hair color. Once completed you review the choices that you made, and either edit or finalize them. eSalon asks you whether you would like to submit a current photo of yourself for their colorists to use as a tool when they review your order. For this reason it is a really good idea to furnish them with a current picture because it gives them a much better idea of how to customize your color. They even ask you to describe your coloring goals in order to better assist you. *Please note that eSalon does not make bold hair colors in unnatural shades. If there are further questions, or if the colorists have any suggestions then they will call you to discuss your order. After I submitted my online order to eSalon I received a call, and had a lengthy and illuminating conversation with one of their expert colorists, and as a result the color that I chose was further modified. Once your order has been finalized, then the details are carefully checked by the colorist and then it is sent to "The Machine" to create your custom color, and your specific formula is saved so that eSalon can recreate the precise color for you again and again. eSalon actually manufactures the color on site at their elegant modern warehouse location that also houses their office and salon. After your order is complete they pack it and send it out to you with detailed instructions. 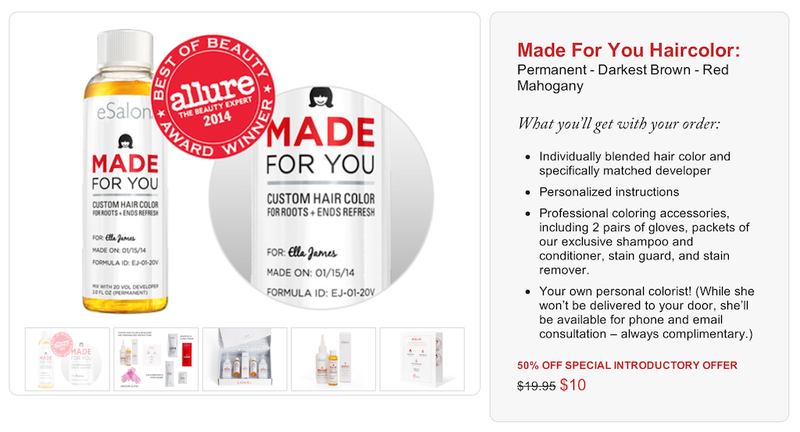 It's a truly revolutionary way to get exactly what you want in luxury hair color, and at an amazing price. Since I live in Los Angeles I was invited to eSalon to have their world renown colorist, and eSalon Color Director and Partner, Estelle Baumhauer, apply my color for me! Estelle is eSalon’s Color Director and is the person responsible for ensuring that eSalon delivers its clients the same quality haircoloring formulations offered at some of the world’s most exclusive salons. Originally from France and trained in Paris, Estelle has been an expert colorist at renowned salons around the world, including Dessange in Paris, New York and Washington and Warren-Tricomi in New York. With over 20 years of experience as a colorist, Estelle has done thousands of hair color applications. 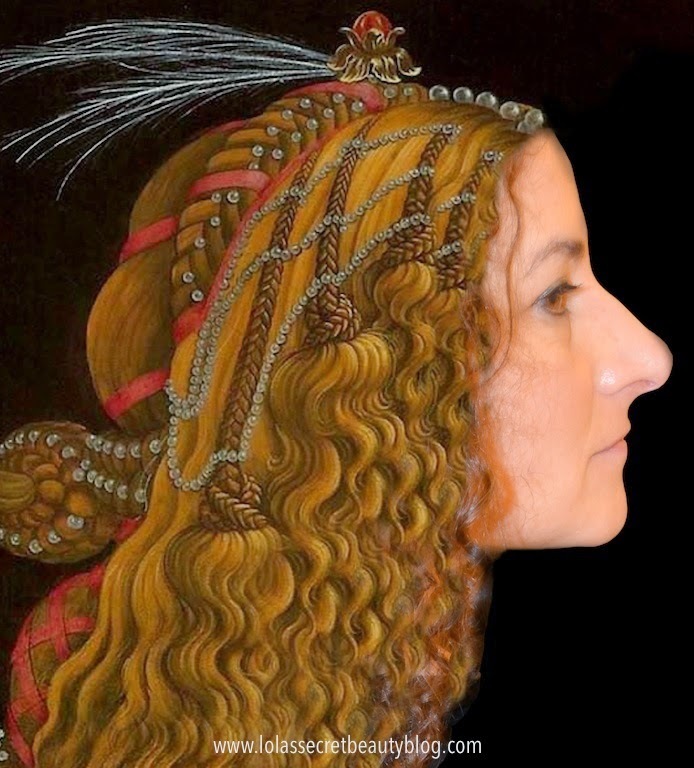 Her extraordinary coloring skills have taken Estelle beyond applying haircolor to her own clients. Estelle has been an instructor to other colorists, traveling throughout Europe and the USA for this. She has also been selected by exclusive brands such as Chloe and Marc Jacobs to be their colorist for the New York fashion shows. 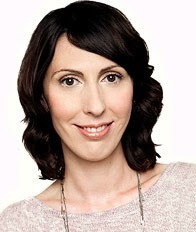 Estelle has been profiled in several publications including the New York Times and Vogue. 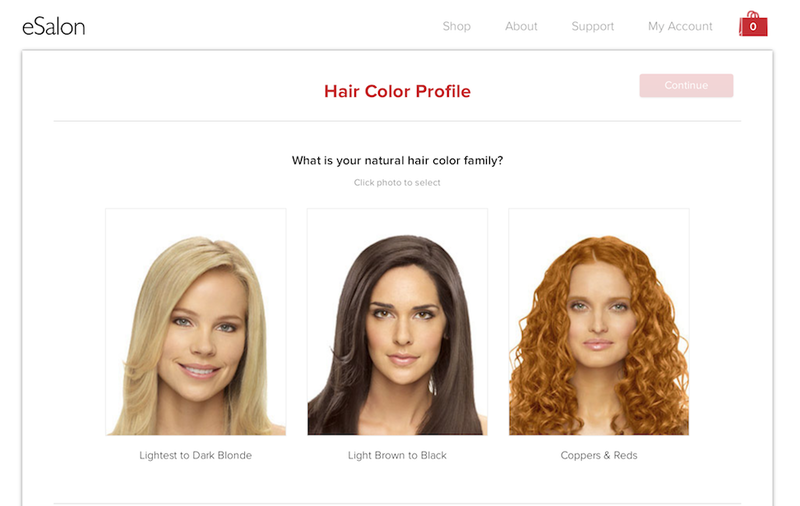 Now in Los Angeles, Estelle is here to make salon-quality hair color affordable for everyone. Upon my arrival at eSalon, the lovely Estelle gave me a tour of their breathtakingly beautiful space. She also looked at my hair and asked me a few more questions about what I desired in my hair color, and then said she would make a few more modifications to my custom color. While she did that she graciously let me run around taking pictures. Unsurprisingly, eSalon has earned the most prestigious awards in the industry. For instance, Total Beauty voted eSalon “Best Hair Color” for 2013 and 2014, Allure gave eSalon the highly coveted Best of Beauty Award for “Best Home Hair Color” and InStyle Magazine named eSalon the “Best of the Web!” Trust me when I tell you that these awards are all very well deserved! They have gorgeous vignettes throughout their space, and many include valuable printed "Tips from our Colorists." Even the washing station is a study in elegant modernist simplicity. When Estelle finished customizing my hair color she sent her "recipe" to The Machine and then emerged from the back with my hair color. Let me just say that it was an extraordinary honor having a colorist of Estelle's stature coloring my hair, and not only did she do an exemplary job, but we also had so much fun together. Her expertise led to a refining of the color that I had selected, and the results were amazing. Estelle felt that going back to my natural dark brown hair might be a bit severe, and since my hair naturally lightens so much in the Los Angeles sun she sought to find a color that toned down some of bleaching effects of the sun while retaining the sun-kissed color. I deferred to her expert judgment, and I am so glad that I did! She also gave me a blow out with straight hair, and for the life of me I wish that I had taken a picture directly following, but alas I got home late that night and neglected to do so. It was one of those amazing, and rare, situations where you meet someone and immediately click. Not only is she a rare talent, but Estelle is also one of the most intelligent, cultivated and interesting people that I have met in a very long time. She is amazing and I am grateful to know her. Estelle showed me all of the products that they make, all of which thoroughly wowed me, and many of which she used on me-- and all I can say is they are A M A Z I N G! eSalon's fantastic hair care products and tools that are artfully displayed! COLOR KISS Temporary Root Touch Up ($15.00 Available in 10 colors): "This unique wand covers regrowth (roots) with matching temporary hair color, for heart-fluttering perfection between hair color applications." Apply COLOR KISS to regrowth along your part and hairline. Blend with hair. Let dry 3 minutes. Wash with eSalon COLORSAFE SHAMPOO to remove. Ingredients: Water/Aqua/EAU, Isododecane, Alcohol Denat., Trimethylsiloxysilicate, Aloe Barbadenis (Aloe Vera) Leaf Juice, PVP, Sorbitan Sesquioleate, Polyglyceryl-4 Isostearate, Disteardimonium Hectorite, CI 77004/Kaolin, Cetyl PEG/PPG-10/1 Dimethicone, Hexyl Laurate, Allantoin, Panthenol, Disodium, EDTA, Propylene Carbonate, Phenozyethanol, Ethylhexyethanol, Exthylhexyglycerin. May Contain: CI 77019/Mica, CI77891/Titanium Dioxide, CI 77492/ Iron Oxides, CI 77491/ Iron Oxides, CI 77499/Iron Oxides, CI 75470/ Carmine, CI 19140/ Yellow 5 Lake, CI 77288/Chromium Oxide Greens. Left to Right: Hair Clips, LOVE UNCONDITIONALLY Conditioner Packettes, STAIN GUARD Packettes and HEART LOCK IT Shampoo Packettes. Hair Clips ($10.00): A set of four large alligator hair clips designed to simplify your color application. Also useful while styling your hair." LOVE UNCONDITIONALLY Conditioner Packettes (.99 for 0.5 fl oz. ): "Ultra-moisturizing salon conditioner to prevent color-treated hair from fading." Travel friendly Love Unconditionally Color Safe Conditioner adds moisture and shine to color-treated hair. Packed with beneficial amino acids and proteins, this advanced formula is designed to strengthen and soften all hair types, but is gentle enough to protect color from fading. Use it daily to condition and detangle color-treated hair.15 ML/ 0.5 fl oz. Gentle enough for daily use. For all hair types. Ingredients: Water/Aqua/EAU, Cetearyl Alcohol, Dimethicone, Behentrimonium Methosulfate, Silk Amino Acids, Wheat Amino Acids, Laurdimonium Hydroxypropyl Hydrolyzed Wheat Protein, Hydrolyzed Vegetable Protein PG-Propyl Silanetriol, Hydrolyzed Wheat Starch, Hydrolyzed Wheat Protein, Sodium PCA, Glycerin, Panthenol, Polysilicone-15, Disodium EDTA, Methylisothiazolinone, Methylchloroisothiazolinone, Fragrance (Parfum). STAIN GUARD Packettes (.99 for 0.2 oz. ): "Apply to skin around hairline and on ears before haircolor application. Guard your skin from hair color stains with the Stain Guard Packette." Ingredients: Cocos Nucifera (Coconut) Oil, Petrolatum. Ricinus Communis (Castor) Seed Oil, Helianthus Annuus (Sunflower) Seed Oil, Beeswax/Cera Alba/Cire d'abeille, Fragrance (Parfum), Hexyl Cinnamal, Limonene, Linalool. HEART LOCK IT Shampoo Packettes (.99 for 0.5 fl oz. ): "Sulfate-free shampoo suitable for daily use on color-treated hair ." Travel friendly Heart Lock It Color Safe Shampoo gently cleanses color-treated hair without using harsh ingredients that cause color to fade. The nourishing blend of proteins and amino acids deeply moisturizes and strengthens all hair types, leaving you with beautiful results. Ingredients: Water/Aqua/EAU, Sodium Lauroyl Sarcosinate, Disodium Laureth Sulfosuccinate, Cocamidopropyl Hydroxysultaine, Sodium Lauryl Sulfoacetate, Cocamide MEA, Silk Amino Acids, Wheat Amino Acids, Laurdimonium Hydroxypropyl Hydrolyzed Wheat Protein, Amodimethicone, Polyquaternium-10, Panthenol, Sodium PCA, Polysilicone-15, C11-15 Pareth-7, Glycerin, Trideceth-12, Peg-6 Caprylic/Capric Glycerides, Glycol Distearate, Sodium Lauroyl Lactylate, Peg-150 Pentaerythrityl, Tetrastearate, Laureth-9, Citric Acid, Methylchloroisothiazolinone, Methylisothiazolinone, Fragrance (Parfum). PERFECT ENDING Leave In Conditioner ($15.00 for 5 oz. 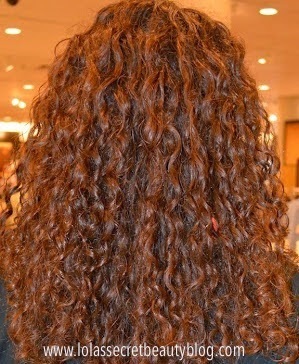 ): "Breeze through tangles, fight frizz, and prevent breakage during styling with Perfect Ending Leave in Conditioner. This colorist-approved formula infuses your strands with serious shine and weightless moisture for a perfectly polished salon look." Ingredients: Water (Aqua/Eau), Cyclopentasiloxane, Propylene Glycol, Hydrolyzed Lupine Protein, Dimethiconol, PEG/PPG-18/18 Dimethicone, Cetearyl Alcohol, Behentrimonium Chloride, Cetyl Alcohol, Behentrimonium Methosulfate, Quaternium-33, Quaternium-87, Amodimethicone, Polyquaternium-4, Cetrimonium Chloride, Trideceth-12, Hydroxypropyl Guar, Glyceryl Undecylenate, Aminomethyl Propanol, Carbomer, Chlorphenesin, Phenoxyethanol, Fragrance (Parfum), Benzyl Salicylate, Citronellol, Limonene, Alpha-Isomethyl Ionone, Geraniol, Hexyl Cinnamal, Butylphenyl Methylpropional, Linalool, Sodium Benzoate, Cyclotetrasiloxane, Gluconolactone, Calcium Gluconate, Dipropylene Glycol, Isopropanol. Color Safe Conditioner and SHINING ARMOR Renewing Treatment Oil. HEART LOCK IT Color Safe Shampoo ($15.00 for 8.5 oz. ): "Sulfate-free shampoo suitable for daily use on color-treated hair." Heart Lock It Color Safe Shampoo gently cleanses color-treated hair without using harsh ingredients that cause color to fade. This nourishing blend of proteins and amino acids deeply moisturizes and strengthens all hair types, leaving you with beautiful results. LOVE UNCONDITIONALLY Color Safe Conditioner ($25.00 for 8.5 oz. ): "Ultra-moisturizing salon conditioner to prevent color-treated hair from fading." Love Unconditionally Color Safe Conditioner adds moisture and shine to color-treated hair. Packed with beneficial amino acids and proteins, this advanced formula is designed to strengthen and soften all hair types, but is gentle enough to protect color from fading. Use it daily to condition and detangle color-treated hair. SHINING ARMOR Renewing Treatment Oil ($18.00 for 1.69 oz. ): "Nourishing blend of argan oil, antioxidants, and vitamins E and F for smooth, healthy hair. Increases shine, strengthens hair, and helps protect color from fading." This is your secret weapon for maintaining luscious locks. This nutrient-rich formula glides over hair to help hydrate, smooth, and strengthen. Wear this Shining Armor to transform unmanageable hair into a shiny vivid mane that obeys your every wish. Ingredients: Cyclopentasiloxane, Dimethicone, Phenyl Trimethicone, Argania Spinosa Kernel Oil, Dimethiconol, Ethylhexyl Methoxycinnamate, Cocos Nucifera (Coconut) Oil, Mineral Oil/Paraffinum Liquidum/Huile Minerale, Tocopheryl Acetate, Aloe Barbadensis Leaf Extract, Zea Mays (Corn) Oil, Fragrance (Parfum), Citral, Hexyl Cinnamal, Limonene, Linalool, Beta-Carotene (CI 40800). COLOR TINT BRUSH ($1.25 each): "This professional, reusable coloring brush provides accurate control and precise application of hair color." COLORING TOOLS SET ($20.00): "Professional hairstylist tools for an easy color application. Includes bowl, clips, and timer." This reusable Coloring Tool kit includes everything you need to color your hair like a professional. This kit provides you with the tools to: section, mix, apply, and time your hair color application. This set is well worth having to accompany your custom hair color! The eSalon custom color kits come in lovely whimsical boxes embellished with motifs found in the decor around their beautiful headquarters in Culver City. Every detail at eSalon is stylish and beautiful! Behind the screen is where "The Machine" makes your custom color! A Sneak Peek behind the screen! Behind the screen you first see piles of boxes to be filled, checked and double checked with your orders. Because of their proprietary cutting-edge technology I haven't shown the computers and the assembly line where the bottles are filled, but I will say that it was both exciting and fascinating seeing it in action. The beautifully ornamented glass wall peek-through, to a conference room, mirrors the interior of the boxes that eSalon uses to ship your products to you. eSalon really is a peerless visionary company! A view of eSalon employees hard at work, and many of them are processing online orders. It is so rare to enter a workspace filled with so many happy people who actually love their jobs, but that was most assuredly the case here! Who wouldn't be happy working in an environment so artfully conceived that it includes sculpture adjacent to the kitchen and work spaces. Around every corner there are beautiful things upon which to look. A gorgeous vignette that greets you near the bathrooms. Estelle told me that she was going to go in the back to get me a a bottle of the hair color that she created for me to take home, but then she emerged from the back with this! Note the motifs used on the box interior that echoes the glass wall of the conference room wall shown above. My customized hair color from Estelle, and as you can clearly see she achieved precisely what she sought to do by softening some of the red hues! I am utterly thrilled by the results. Overall Assessment: Never again will I buy drugstore hair color, or pay go to a salon for an exorbitantly priced cut and color when eSalon gives such amazing results for a mere $20.00. eSalon's hair color is long-lasting, easy to care for and maintain, and utterly gorgeous. I'm touched by Estelle and eSalon's generosity, and humbly thank them for such an amazing experience, and for so many beautiful products to use at home! You have a customer for life! Get 50% OFF & try eSalon custom color for $10.00. Click here to get started! A portion of your October purchase will be donated to CancerCare® to help support Breast Cancer Awareness. Services and products provided courtesy of eSalon (Unaffiliated Links). Uhm...can I just say that the next time I am in LA I want to hang with you for your adventures for a few days? Seriously, I want to be in on all that fun you are having at all these events! I honestly love the red in your hair. I wouldn't change it! Thank you! It always comes back! By the end of the summer it gets even a little lighter and more red! oh boy ... I totally just bought this!! So it better be that good! ;) I didn't even finish reading your post (I did NOW lol) I just went directly to esalon via your blog. I'm excited to receive it!! :) Thank you!